Watch HDTV from HD digital cable box or watch DVD. For Dolby Digital 5.1 surround sound, connect the digital audio out (coax or optical) from your HD digital cable TV box to a 5.1 capable A/V receiver with loudspeakers. Any TV show with Dolby Digital 5.1 sound will be heard on the surround system. 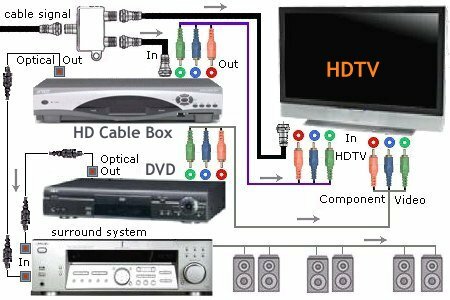 Your DVD movie with 5.1 surround sound can also be hooked up to another digital audio input on the same Audio Video receiver. You could also connect two RCA stereo audio cables from cable box to HDTV and from DVD to HDTV. High Definition TV allows enhanced audio as well as HD video and this includes Dolby Digital™ 5.1 surround sound. The 5.1 means five speakers and one subwoofer to envelope you in sound. Two front speakers and two rear speakers put you in the center of the action. A fifth, center-channel speaker is positioned above or below your TV. The subwoofer can be placed anywhere in the room, and delivers the low-frequency bass effects to complete the big cinema sound experience. A surround sound system is usually completed with a "receiver" box that controls the sound for all the speakers. To maximize your HD Television set-up, choose the right audio cables to connect surround sound to your HDTV. *HDMI cable - The simplest and best way to connect your HDTV to surround sound, HDMI cables carry crisp, clear audio and video signals in a single cable. *Optical cable - Transferred in a fiber optic cable, this audio signal is sent with light pulses and supports stereo to multi-channel audio transmission. Compatible with AC-3, Dolby Digital and Stereo. *Digital Coax cable - Transferred in a single shielded cable, this audio signal is sent with electrical signals, and supports stereo to multi-channel audio transmission. Compatible with AC-3, Dolby Digital and Stereo. *RCA cable - An analog signal output used to transmit mono or stereo audio channels.